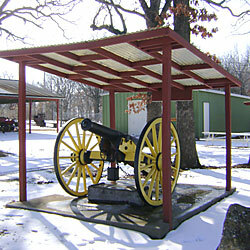 Description: A 6-Pounder iron smoothbore field gun is displayed in an open-walled structure next to the City Museum. The carriage has recently been restored. A painted wooden sign reads: "CANNON ~ 1823 Walking Stick ~ 6 Pounder-Mfg. By ~ McClurg, Pittsburg". 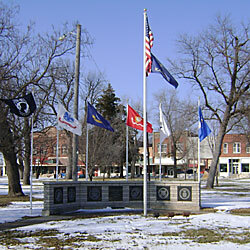 Description: A flagpole is flanked by two granite monuments. The right monument is inscribed: "In Memory of ~ Vicksburg Post No. 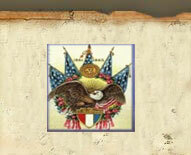 72 ~ Grand Army of the Republic ~ 1861 - 1865 ~ Lawton Circle No. 97 ~ Ladies of the G.A.R.". 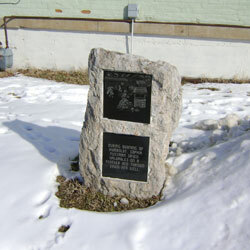 The left monument reads: "Memorial to ~ Veterans of all wars ~ by American Legion ~ Algy Doty Post No. 118 ~ and Auxiliary Unit". Description: A large monument consisting of a centrally located polished black granite tablet mounted on a cut stone monument is flanked by two polished black granite monument. The central monument has an engraved picture. The left monument is inscribed: "Civil War ~ Monument ~ Constructed 1997 ~ Humboldt Chamber of Commerce ~ Dedicated to the citizens of ~ Humboldt, Kansas, past and ~ present, who believe the ~ strength of a community ~ lies in its faith in God and ~ each other, its integrity, ~ and its commitment to ~ freedom for all, ~ Humboldt, Kansas ~ A Delightful Place". The right monument is engraved: "With malice toward none; ~ with charity for all; ~ with firmness in the right, ~ as God gives us to see the ~ right, let us strive on to ~ finish the work ~ we are in - ~ A. Lincoln ~ 2nd Inaugural Address ~ We invite you to visit the 12 individual Civil War markers ~ located throughout the city. ~ Free maps are available ~ at local businesses." 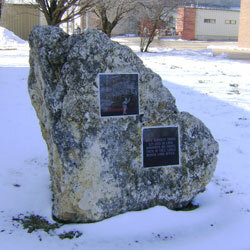 Other markers include an engraved picture and text. Stop 1 on the trail is: "Confederate Soldier ~ was shot here. ~ Oct 14, 1861, as he ~ tried to remove ~ Union flag". Stop 2 is "Kate Burnett saved ~ $25,000 in land ~ warrants by hiding ~ them in tall grass ~ behind land office". Stop 4 is: "During burning of ~ Humboldt, Sophia ~ Fussman saved ~ valuables on a ~ feather bed thrown ~ down her well". Other stops are described in a brochure. 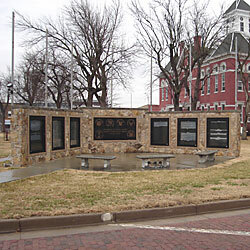 Description: A memorial plaza is formed by a stone wall and a flagpole. Mounted in the stone wall on polished black granite insert is: "Lest We ~ Forget ~ Those Who ~ Serve". 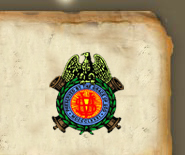 Other inserts have the seal of the modern branches of the military. Slightly in front of the monument is a small granite plaque engraved: "Donated by ~ the people who care ~ 1992". Description: Granite base with granite soldier statue mounted on top. 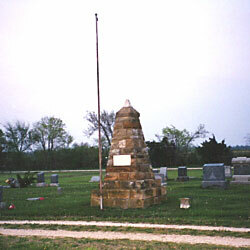 The inscription on the front of the base reads: "This memorial in memory of Union soldiers who ~ fell in battle was dedicated on May 31, 1909, and ~ maintained by McCook Post No. 51, G.A.R. ~ In 1998 the statue was refurbished and a new ~ pedestal was erected. 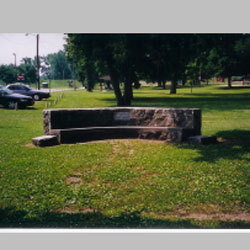 On June 2, 2001 this ~ monument was rededicated by the Veterans' Day ~ Committee of Iola." Below is another inscription: "McCook Post No.51 G.A.R. ~ Erected May 30, 1909". The four concrete replicas were made recently from a cast taken of one of the four original sandstone "cannon" replicas (roughly approximating the shape of an eight-inch mortar) that were located on the corners of the square base of a Civil War soldier statue monument. The original sandstone "cannons" were removed in a 1990s monument restoration as they were in very bad condition due to erosion and severe spalling. 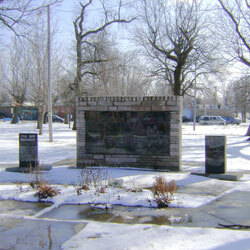 Description: A concrete bench is placed in Riverside Park. 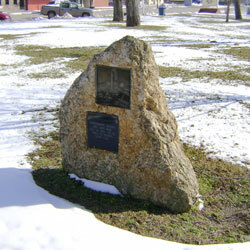 The inscription reads: "McCook Post No. 51 ~ By ~ Ladies Of The G.A.R." Description: A 3-Inch Ordnance Rifle is placed on a brick and mortar mount. 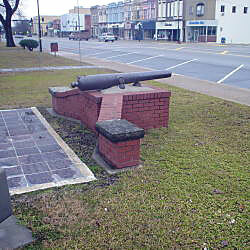 The cannon is in front of a modern Veterans Memorial Wall. The cannon was formerly on a concrete base at the south west corner of county courthouse grounds (to the west of the new memorial). 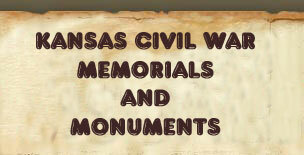 Description: A stone monument with flagpoles is erected to honor the veterans. The center panel is inscribed: "This Memorial Is Dedicated To Those ~ Who Served To Protect Our Freedom ~ And Our Country". 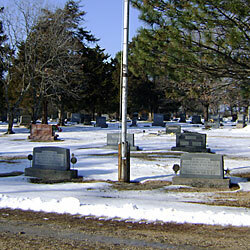 The panel on the far left has brass plaques naming those who served in the Civil War. 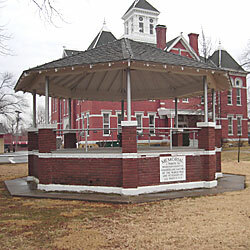 Description: A brick pavilion is erected as a stage. 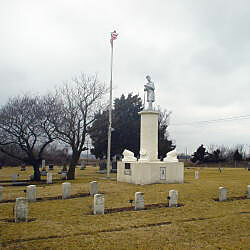 The East side has an inscription reading: "Memorial ~ A Tribute To ~ Woodson County's ~ Soldiers And Sailors ~ Of The World War ~ And Veterans Of ~ All Wars U.S.A."
Description: A Stone monument includes a plaque which is inscribed: "Erected By ~ Sanders Post ~ No. 254 ~ G.A.R. ~ In Memory Of Our Fallen Comrades ~ May 30, 1893".